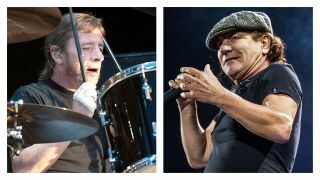 Last week, estranged AC/DC members Brian Johnson and Phil Rudd were photographed together outside Vancouver’s Warehouse Studios. AC/DC have recorded their last three albums at the location, and, the following day, guitarists Stevie and Angus Young were spotted at the same location, sparking rumours that AC/DC could be recording a new album. Now, Crystal Lambert and her friend Glenn Slavens – who grabbed the previous two shots – have shared a photograph of vocalist Johnston and drummer Rudd hanging out with longtime AC/DC engineer and mixer Mike Fraser on the Ear Of Newt website. Fraser’s been behind the desk on the band’s last five studio albums: 1990’s The Razor’s Edge, 1995’s Ballbreaker, 2000’s Stiff Upper Lip, 2008’s Black Ice and 2014’s Rock Or Bust. Fraser has worked with dozens of other artists throughout his career, including Guns N’ Roses, Led Zeppelin, Metallica, Rush, Aerosmith, Motley Crue, Poison, The Cult and Thunder. Johnson was forced to stop touring with AC/DC in 2016 under the threat of permanent deafness, with the band famously bringing in Guns N’ Roses frontman Axl Rose to complete their Rock Or Bust world tour. However, Johnson has since worked with audio experts Asius on a solution to his hearing problems, with Beano taking to the stage following his departure from AC/DC with Muse, Paul Rodgers and, most recently, with Mick Fleetwood. Rudd, meanwhile, was kicked out of the Aussie outfit the same year after being found guilty of drugs possession and making death threats and subsequently served an eight-month home arrest sentence. Drummer Chris Slade was recruited for AC/DC’s live dates. Sign up below to get the latest from Classic Rock, plus exclusive special offers, direct to your inbox!